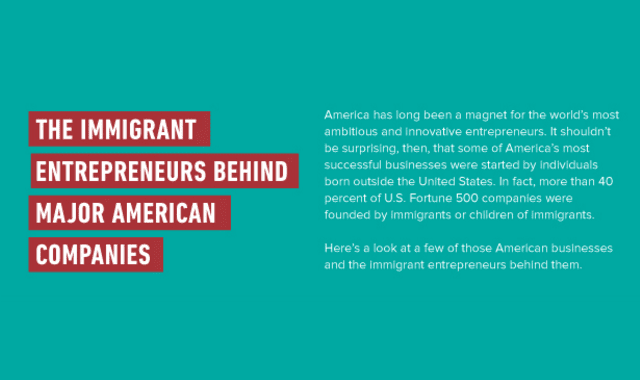 The Immigrant Entrepreneurs Behind Major American Companies #Infographic ~ Visualistan '+g+"
America has long been a magnet for the world's most ambitious and innovative entrepreneurs. It should not be surprising, then, that some of America's most successful businesses were started by individuals born outside the United States. In fact, more than 40 percent of U.S. Fortune 500 companies were founded by immigrants or children of immigrants. Here's a look at a few of those American businesses and the immigrant entrepreneurs behind them.